When I was in Chicago a couple of weeks ago, I spent some time with Roshni and Samir. I went over to their place upon arriving in the city and didn’t leave until almost 11pm! We talked, we watched Wheel of Fortune (their latest guilty pleasure! ), we ate delicious lasagna, and we drank what I can only call Roshni’s smoothie concoction. To be quite honest, when she told me what all was in the smoothie, I was skeptical. I didn’t understand how all of those things together in one drink could possibly be edible…never mind taste good. Well, she proved me wrong! Her random mix of strawberries, blueberries, banana, OJ, ground flax, apple, avocado, spinach, kale, almond butter, and ginger was…refreshing! I even asked her to make it again when I went back to their place later in the week. With Roshni’s smoothie as my inspiration, I set out to create my own drink. The one criterion I had was that it should get Vishnu’s seal of approval. In order to do that, I knew I had to keep things simple. When we went grocery shopping this past Monday, I bought some kale, OJ, and fresh ginger knowing that I wanted to include all three in whatever I decided to make. After a little internal deliberation, I went with this combo –> orange juice, a Granny Smith apple, frozen strawberries, kale, ground flax, and freshly grated ginger (a must in Roshni’s book!). And…It. Was. Delicious. Even Vishnu agreed! 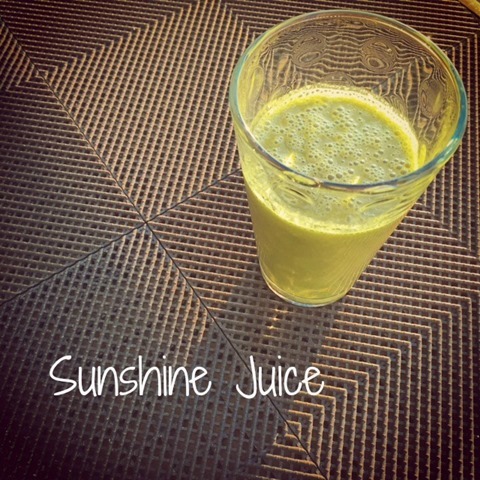 I named it Sunshine Juice because it’s more liquidy than a smoothie and just a bit lighter in taste. And the ginger and OJ combo takes the whole thing to another tart, refreshing, slightly spicy level. Even if there’s no sunshine where you are right now, make this anyway. You’ll feel like you’re sipping on a yummy tropical drink while basking in the rays. I promise! 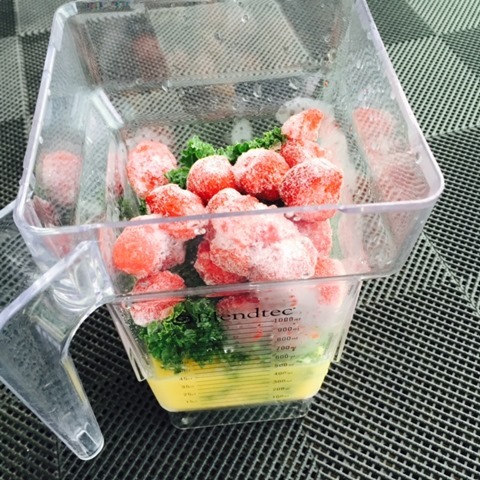 Add ingredients to a blender (in this order) and blend until smooth and juice-like. Note: While any blender should do the job, a high powered blender (such as the Blendtec –> what we own and use) will provide the best results. Ooh – I cannot wait to try this- I’v never ever added fresh ginger to a smoothie before – what a great idea! I think the name is perfect – this sounds awesome! My husband hates ginger in juice and so I’ve been avoiding it. I’m going to treat myself to this. Love how fresh this juice sounds- I’m normally not a big ginger fan but I can imagine what a difference it makes to the overall flavour combination :)! I’ve never added ginger to a smoothie but it sounds like it was refreshing!